KINGFIELD - As the holiday season gets underway, Kingfield Friday Artwalk returns this Friday, Dec. 7 from 5 p.m. to 7:30 p.m. throughout the snow clad village. This Artwalk features antique mechanics (the autos not the technicians), carols at a local restaurant, leatherwork, a local author and much more. Watch for the flying red flags indicating participating venues. Webster Free Library is hosting a display of holiday quilts created by the members of Stichers in the Snow a local quilting group. The library is on Depot Street just down the street from the post office. Light refreshments will be offered. In addition to its usual displays of Stanley family ingenuity and creativity, the Stanley Museum, just up School Street from the library, is featuring the "Steam Team," a group of volunteers who care for the museum's cars as well as others' antique vehicles. They will be available for to answer any of your questions about Stanley Steamers, their upkeep and their history. This in addition to the museum's collection of all facets of Stanley family history and memorabilia -- airbrush painting and photography, photographic dry plate technology, violins and examples of Stanley steam cars. Hearty refreshments will be served. Polly and Rob MacMichael invite everyone to the second annual Jingle Ball at Rolling Fatties two buildings up from Skowhegan Savings Bank. "Get out your Santa suit, your red nose, your elf hat, your red, your white, your green, your sleigh bells, your mistletoe and come ready to carol the evening away." Rolling Fatties is featuring Lee Stetson in his Fatties debut, playing seasonal tunes from 5 p.m. to 8 p.m. in addition to offering their usual locally-sourced fare. Back down Main Street next to the Herbert Grand Hotel, Red Barn Upcycle Market features owner Barbara Wiencek's creative collection of re-purposed furniture, china and other must-haves --many items with a seasonal theme. The market's featured artisan this month is Susan Catino of Highland Beadworks who creates the beverage/wine charms (on special during the artwalk) and necklaces carried by the shop. Barbara will have light refreshments for your enjoyment. Opposite Red Barn on Main Street, High Peaks Artisans Guild's December Artist of the Month is Jean Benson of Carrabassett Clayworks featuring her stoneware. 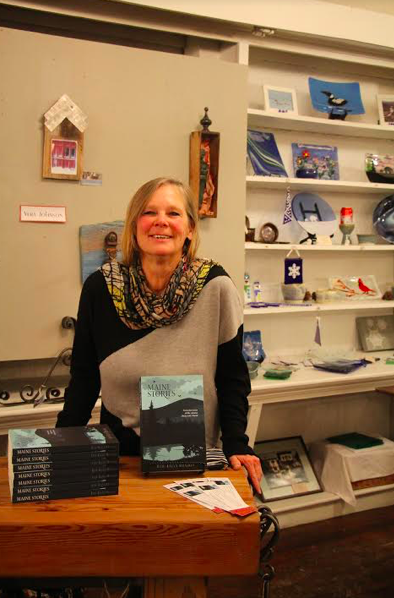 HPAG is also hosting LE Hughes who will give a reading from her latest collection of columns "Away With Words" as seen in the Original Irregular. RJ Gray Jr. is a guest artist this month showing some of his relief prints and selling handmade leather items. Additional media featured by the other guild members include: fiber arts, knitting, oil and watercolor painting, photography, woodwork, woodturning, glass art and jewelry. A variety of refreshments will be available. A little further down the street is Ulrike Stadler's Stadler Gallery of Contemporary Art, full of her paintings, prints and stained glass as well as other artists' work, including Tatiana Maxsimic's paintings.